For the month of April our Access and Safety Store have a fantastic 10% discount on our range of CARGO Workwear. Safety footwear and hi-vis gear are just some of the many ranges available. CARGO Workwear was designed for craftsmen, tradesmen and general operatives who where seeking comfort, style and quality in their safety footwear and clothing. The Cargo Ultra Safety Boot with composite toe cap and kevlar midsole, has a smooth leather finish upper, a padded fabric lining, and a full foot-bed offering superior comfort. It is fully waterproof and has an exterior scuff cap and a 300 degree heat resistant sole. It is also antistatic, has a shock absorbing heel, oil/acid resistant soles, and it also meets the maximum SRC slip resistant safety standard. The Cargo Ultra Trouser is made from a tough and durable canvas and polyester mixed material, offering you the highest of performance. The addition of codura reinforced material on the knee and leg really does help with prolonging the life of the garment. Also, having a tough YKK zip, 8 reinforced belt loops and triple stitched seams, you can actually feel the quality when you see this trouser. The Cargo Ultra Jacket is made from an innovative waterproof ripstop material. It has a warm fleece lined inner quarter section. Featuring a concealed hood, adjustable cuffs and waistband, it is comfortable to wear and gives a great fit. Convenient pockets with stud closure, including dual access side pockets, and a breast pocket, as well as inside mobile phone pocket, keep your possessions save at all times. With the option of removing the sleeves, the jacket can be used as a Bodywarmer or a full jacket and as such can be used in both the harshest of weather conditions as well as the mildest ones. If you need a hard wearing jacket, this is the one for you. The Cargo Storm Safety Boot with Composite Toe Cap and Kevlar midsole has a honey colour nubuck leather upper, with a padded mesh lining and EVA footbed. This S3 boot is fully waterproof, and is very lightweight in comparison to metal footwear. It also has a shock absorbing heel, oil/acid resistant dual density cemented sole, and it also meets the maximum SRC slip resistant safety standard. 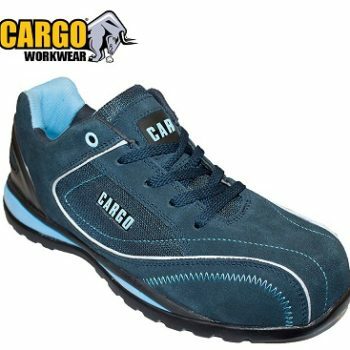 The Cargo Pacer Safety Trainer with composite toe cap and a Kevlar midsole has a blue suede leather upper with a breathable padded mesh lining, and a fully lined footbed. This S1P boot is also antistatic, has a shock absorbing heel, oil/acid resistant sole and meets the minimum SRC slip resistant standards. 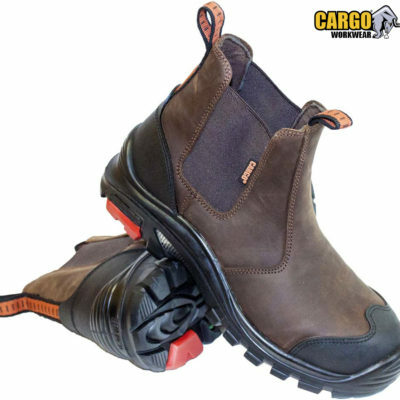 The Cargo Elite Dealer is a Metal Free Slip on Dealer Safety Boot with a smooth hard wearing, water repellent leather upper. It has a tough TPU material scuff cap and heel support. It comes with a full absorbent and breathable lining and a fully lined comfort PU footbed. A composite toe cap and a kevlar protective midsole make it extremely lightweight. Coming with a shock absorbing heel, it is antistatic, oil & acid resistant and comes with a dual density black Rubber/PU sole and it also meets the SRA slip resistant safety standard. The Cargo Dealer Boot with Steel Toe Cap and Midsole has a hard wearing, smooth leather upper, a full cambrelle style absorbent and breathable lining with a fully lined footbed. It has a patented heel support structure and a shock absorbing heel, and has an antistatic oil/acid resistant dual density black PU sole and it also meets the maximum SRC slip resistant safety standard. Cargo Winter Snap Glove is a tough cold weather glove, with a polar fleece lining for warmth. This full fingered glove has an elasticated wrist, padded palm, and high performance PVC grip and a convenient pairing hook for easy storage. Tested to EN388 standards, this glove is one hard wearing, tough and durable glove. The New Cargo Regal Trouser is made from an innovative Ripstop twill cotton and polyester mixed material. Featuring tool and nail pockets along with multi purpose leg pockets and a convenient tool loop it offers functionality and style. Including a rugged YKK Zip, Reinforced Cordura Knee pad pockets and Trims along with triple stitched seams, durability is guaranteed. The Cargo Reflex Softshell Fleece Jacket is made with a high stretch, breathable, waterproof & windproof fabric. With attractive red piping and trims, the jacket features multiple pockets including, 2 zipped side pockets, a sleeve pocket and a zipped breast pocket. An inside large pocket with velcro fastening offers extra security. For comfort the jacket has an adjustable drawstring waist. 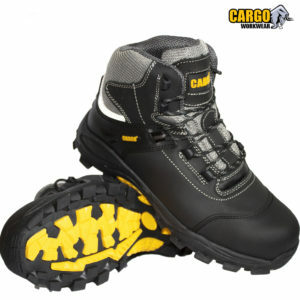 The New Cargo Maxima Metal Free S3 HRO Safety Boot has a nubuck leather upper with black mesh trim for breathability. It has a fully lined comfort footbed. This S3 boot is waterproof, has a composite toe cap and a kevlar midsole, making it extremely lightweight and suitable for all weather. It is also antistatic and has a shock absorbing heel with patented support section.Its sole has HRO approval 300 degree C heat resistance emergency contact only, and is also oil/acid resistant.It meets the maximum SRC slip resistant safety standard. The Hi-Vis Two Tone Parka Jacket has a fluorescent & navy PU coated outer shell giving you additional visibility and a waterproof exterior, with a 100% polyester black patch lining for added heat and comfort. This class3 parka has two reflective strips over the shoulder and two around the torso and arms. Multiple pockets, knitted cuffs, and an enclosed hood with a toggle fastening for securing to the face in extreme conditions. The Hi-Vis Parka Jacket is a 3/4 length jacket with a flourescent 150D oxford PU coated waterproof outer shell. A quilted black polyester patch lining adds heat and comfort to the jacket. This class3 parka has reflective strips over the shoulders and twice around the stomach area. Multiple pockets include mobile phone inside and out, map, inside chest, and 2 front patch pockets. The hood folds neatly into the collar and the hood also has a drawstring toggle for sealing to your face in extreme conditions. The Hi-Vis Bomber Jacket has a flourescent polyester outer shell offering additional visibility and protection from the rain. A padded lining giving heat and comfort when worn. This class3 hi-vis bomber has reflective tape over the shoulders and twice around the stomach area. Multiple pockets include inside and outside pockets, 2 front inset pockets and 1 inside chest pocket. The hood is neatly folded within the collar which is easily accessed and stored. A full zip closure with a pop fastening storm flap, offers additional protection from the rain. The Cargo Astro Safety Boot with composite toe cap and kevlar midsole is one of the lightest safety boots on the market today. It is fully waterproof. It has a grey suede leather upper with breathable mesh section. With a grey mesh padded lining and a full comfort insole. It has a shock absorbing heel, oil/acid resistant soles, and it also meets the SRA slip resistant safety standard. Cargo Aquavis Trousers are a 100% waterproof and hi-vs trouser that has a full comfort lined inner, with an elasticated waistband and ankles for ease of fit. This class 1 garment has two reflective strips around both legs. 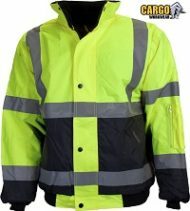 Ideal for working in cold wet environments when heat and visibility are a concern. The Cargo Apollo Metal Free Safety Boot has a crazy horse leather upper with a black padded mesh lining and a fully lined footbed. This S3 boot is waterproof, has a Composite toe cap and a Kevlar midsole, making it extremely lightweight. It is antistatic, has a shock absorbing heel with patented support section, it also has an oil/acid resistant dual density PU black/TPE non marking sole, and it also meets the maximum SRC slip resistant safety standard. The New Cargo Alpha Trouser is made from a tough twill cotton and polyester mixed material. With an elasticated waist band, with gripper strip, and large belt loops, it offers maximum comfort and great fit every time. Featuring Multipurpose leg pockets and a convenient tool loop along with Hi Viz strips it offers functionality and style. Including a rugged YKK Zip, Reinforced Cordura Knee pad pockets and Trims along with triple stitched seams, durability is guaranteed. The Cargo Action Zip hoodie is made with a 320 GSM Knitted Polyester Melange material which is breathable & windproof. It is fleece lined for warmth and has waterproof softshell patches with reflective trims. The jacket features multiple pockets including 2 zipped side pockets, and a zipped chest pocket.For comfort the hoodie has an adjustable drawstring hood and an inner weather proof flap on the top section of the zip. To see the full range of CARGO Workwear available please click here, to visit our online shop. If you would like to speak to a member of our sales team please contact Belfast on +44 (0) 28 90454599 or Ashbourne on +353 (01) 802 7173 or click the button below to send your enquiry via email.